Robot lunch bag. 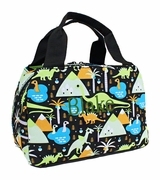 Colorful whimsical robots can't be missed on this fun and practical lunch tote bag. Just the right size for a child's favorite lunch items... can easily fit a drink, fruit, sandwich and mid-day snack. Double carry straps will make it easy for them to tote their food items to the afternoon picnic, day car trips or school lunch. Two outside open pockets can hold a choice toy or game.